Genius Loci Games: Day 7 - The First D&D Product You Bought - IT BE TOYS! Day 7 - The First D&D Product You Bought - IT BE TOYS! Technically the first D&D product I ever bought was some toys from the early 80s line (and strangely had nothing to do with the cartoon that was out at the time :( ). I got two, both bought with money earned from shoveling snow. The first was a green goblin guy. I forget his name, I forget why I thought he was so damned cool when I got him, and I don't have any of his weapons or such ... but I still have him! He sits on the top shelf of my gaming bookcase, looking down at me with more menace than a toy should have. The other was a an ancient evil wizard (who I think was in the show once) with a real felt robe and just this presence of pure evil that I thought he was awesome. I remember using him with my He-Man toys as an alien Wizard King from a race of midgets (to explain why he was smaller than Mattel's toyline). I still have him as well, and his big staff. He resides in my current work place were he looms over me from the top of my computer tower and demands that I get those reports done even faster! I could go on. 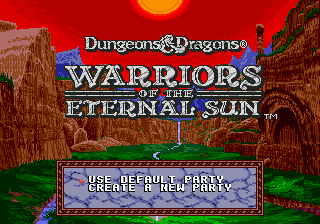 I could mention that the first Dungeons & Dragons game that I bought was the Sega Genesis title "Warriors of the Eternal Sun", however, I believe I will instead be serious about such things at this point at least. The first "real" Dungeons and Dragons product I bought, was the 3.5 editions books back in 2003 at The Book Stan (slight correction from yesterday, there is no "d" in the name of the store) comic and gaming shop. To this day they hold the top spot on my gaming bookshelf, followed by my print copies of Swords and Wizardry Complete and Basic Fantasy Roleplay. The "Core 3" are all there, with notes scribbled in, and parts highlighted. Nothing as bad as my 3.5 Forgotten Realms book, but close. That wizard's name was Kelek, and he hunted down unicorns for their horns for some reason. He was only in a single episode of the D&D cartoon. I had the same figure. I thought he was cool. I still have the staff, but nothing else. And the green dude is a half-orc assassin. Ummmm, don't take this the wrong way but . . . *bought . . . . .
Feel free to delete this when you fix the spelling.